Hi. I’m Annemarie with Speak Confident English and welcome to your Confident English Wednesday Lesson. This is exactly where you want to be every Wednesday if your goal is to improve your fluency and confidence in English. This week is a particularly special lesson. 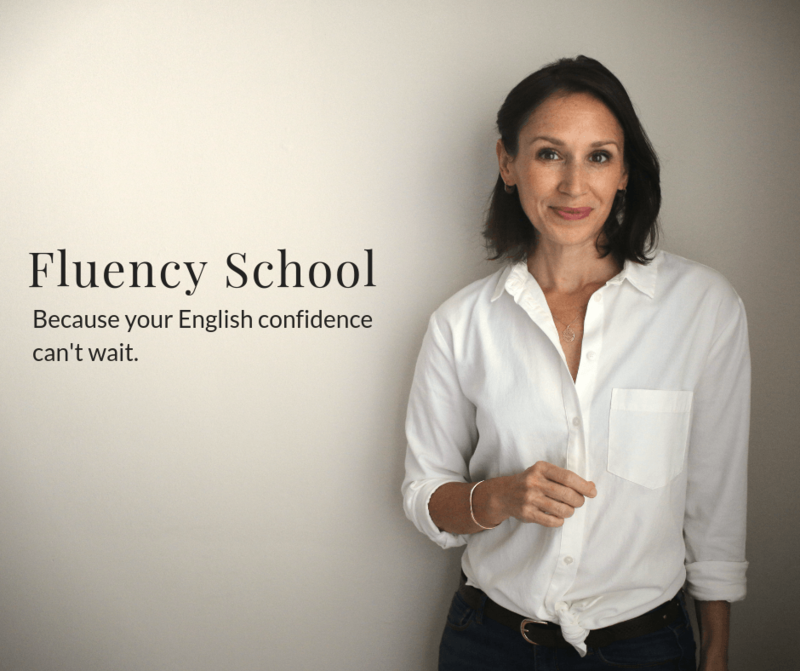 Over the last week, I’ve been hosting the 10-day fluency challenge and it has been incredible to see what is possible, what you can accomplish in English when you challenge yourself and when you do something in English every day for 10 days. We’re going to continue on that theme. I’m going to challenge you to do something in English everyday for 30 days. In today’s online lesson, I’m sharing with you my favorite, favorite, favorite TED video. It is a video by Matt Cutts who talks about trying something new for 30 days to change your life and that is what we’re going to try to do with your English. In the lesson, there are a variety of activities that I’ve created with this video including vocabulary activity, the opportunity to practice some idioms, and of course this 30-day challenge. I want you to be successful. I don’t want you to create a challenge and then forget about it because you won’t make progress. In this video, we’re going to talk about the four keys that you need to make sure that your 30-day challenge is successful plus a secret power word. Key number one is consistency is everything. It is very important that you find something in English that you can do every day. I know that sounds like a lot and it might sound impossible but we’re going to make it possible and we’re going to look at some other things that will help you do that. Here’s why it’s so important that you do it everyday. If you’re not consistent, you won’t change. Just look at an example like training for a marathon or trying to lose weight. If you’re training for a marathon and you only run one time a week or one time a month, that marathon might be impossible. If you’re trying to lose weight and you only exercise on Sundays and you only eat healthy on Sundays, there won’t be any progress. It really means that you have to do it everyday. Here is the beautiful thing about that. When you do something for about 21 to 30 days, it stops being difficult because it becomes a habit. It becomes a part of your routine. It’s just normal in your daily life to do that one new activity and that’s what we want. We want this to be easy for you. We want English to be part of your daily life so that you can make progress. It’s easier for you to communicate. It’s easier to find the words that you’re missing when you’re speaking. All of those things will become easier when you do something everyday. Now let’s look at key number two. Start small. That is the key for number two. It is not possible to change your life or to completely change your English in just one day but you can completely change your life or your English when you do a little bit every day and it becomes a routine, when it becomes part of your daily life. You probably don’t have two hours or four hours that you can commit to doing something in English everyday and that’s okay. You probably have 10 minutes that you can give every day while you’re getting ready for work but driving to work or while you’re walking your dog, cooking dinner, maybe over a lunch break. The key is starting small so that you can really do it everyday and be successful. Key number three to help you be successful in your 30-day challenge is to be specific. Be specific about what you’re going to do in English and when you are going to do it. It will make it easier for you to be consistent and it removes any questions or wondering about what you should do, how you should do it. I’ll give you a silly example. I could say that I’m going to eat more fruit everyday for the next 30 days or I’m going to eat an apple at lunch everyday for the next 30 days. This second option is much more specific. I know exactly what I’m going to eat and when. It’s going to be an apple at lunch. There’s no question. I don’t need to think about it. I don’t need to find something new. I just know what my plan is. What can you do that is specific in English and when can you do it everyday? Is it a blog that you’d really like to start reading in English on something that you’re interested in or a podcast that you’d like to enjoy, that you can listen to everyday on your way to work. Maybe there’s a newspaper that you’d like to read from and you can read one article everyday during breakfast or maybe every night after you put your kids to bed. You could do one Confident English lesson for 30 days. Finally, key number four is make it doable. We talked about in part three, the need to be specific about what you’re going to do for your challenge and when you’re going to do it but we want to make sure it’s really possible for you to be successful. Let’s say, for example, that you decide you’re going to do something in English for 15 minutes everyday right when you get home from work, but then you get home from work after a stressful day and you’re tired. Maybe one of your children is sick or you have to get dinner together and it’s taking a long time and so then you decide not to do it. I really want you to think about what is the best time of day when you are present, you are focused, and you can really commit to that 10 minutes or 15 minutes that you have that you can do something in English. Those are your four keys. Then I have one more thing which is my secret power word. When we start something new, a new challenge, we often feel a little bit of fear, we’re nervous and maybe we start something new. We start listening to something in English or you start reading something in English and you get that feeling of I can’t. I can’t do this, it’s too hard; or I can’t understand it, it’s too difficult for me. I want you to add one word to those sentences. I want you to add the word yet at the end. I can’t understand this yet or I can’t do this yet. There might be a time during this 30-day challenge that you do where you start to feel discouraged. If you start a sentence with I can’t, I want you to finish it with yet because that means that you’re in the process. Every day that you do your challenge, every day that you do this new thing in English, you are making progress and you are getting closer to your goal. If you start to feel discouraged, if you start one of those I can’t sentences, be sure to end it with my secret power word which is yet. You can’t do it yet but you are on your way. Let’s get started. I want you to go to the online lesson. Get some practice. Watch my favorite TED video about doing something new for 30 days. Do some vocabulary, practice an idiom, but then commit to a challenge and you can share your challenge in the comments section. I want to support you. I want to help you be successful. If you commit to something, be sure to share it with me in the comments section and I will be there to encourage you so that you can finish in 30 days and feel amazing and accomplished in what you’ve done. With that, thank you so much for joining me. I love having you here every Wednesday. Enjoy the online lesson. Commit to doing something you in English for 30 days. Find out what is possible. I look forward to hearing from you in the comments section and I’ll see you next Wednesday. Now I can say one thing : I commit to study English every day at last 15 minuts (maybe more….who knows????) lissening, reading or writing…..I ‘d need to speak but I don’t know with whom…..